I thought I would have my first blog entry in 2012 be a bit of news about myself and “let the cat out of the bag” so to speak about my new job. 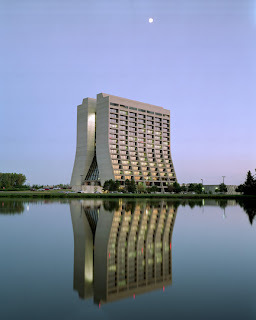 I’ve finished up my graduate work and have decided to join the Intensity Frontier here at Fermilab! 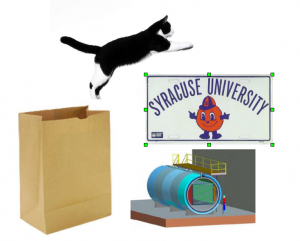 I have taken a Post-Doc position with Syracuse University working on a new experiment, MicroBooNE (Micro Booster Neutrino Experiment). 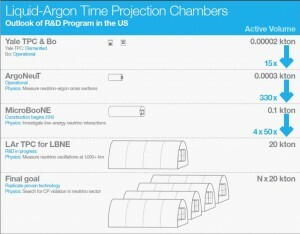 This project is the next step in research for using Liquid Argon Time Projection Chambers (LArTPC) on the massive kilo-ton scale for use in such expeiments like the Long Baseline Neutrino Experiment (LBNE). This LArTPC will be the largest ever built in the U.S. and help achieve important technology achievements. However, R&D isn’t the only reason this experiment is being built. This ~170 ton Liquid Argon Time Projection chamber experiment will follow up on an important anomalous result seen in the MiniBooNE (a water Cherenkov detector) experiment. The main handle that MicroBooNE will have that MiniBooNE didn’t is the ability to separate electrons and photons through reconstruction utilizing the advantages of Argon Detectors. Basically I have spent the last few years of my graduate work becoming an expert in collider physics and searches for new physics at the Tevatron. Having to learn all the software, acronyms, technical tricks of the trade, and mathematics. 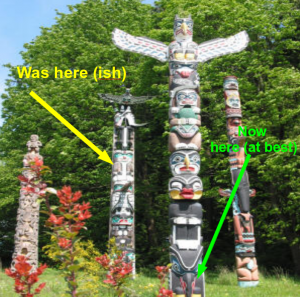 Now, I am leaving this part of physics and starting at the bottom of the totem poll all over! But I think this is a good thing! Not only am I getting to start on an experiment where I’ll actually get to build and see come to life (unlike CDF where I was allowed to stand on the shoulders of many others hard work) but I will also get to participate in this growing field on the Intensity Frontier and hopefully see the growth of the US High Energy Physics in this field! I hope to have much more to say about these things and my new adventures in the wild world of neutrinos in the coming days! New measurement by OPERA…same strange result?!?! 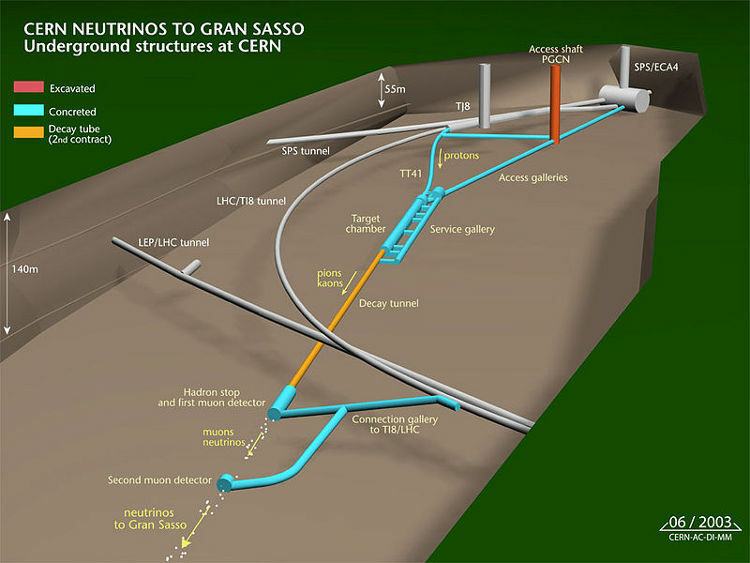 So the BBC is reporting that the results of the neutrino run done most recently by the OPERA experiment is confirming their previous result and continuing to find superluminal neutrino speeds. In this iteration of the experiment OPERA attempted to address, amongst many points, one of their largest sources of uncertainty. Namely, the bunch length of the protons that were being sent from CERN and were producing the neutrinos that they were measuring. By shortening the bunch widths you have a greater certainty about where the neutrinos are being created and thus you know your initial time to a much higher degree of accuracy. Needless to say this is a big deal if it is true. They have updated their paper to include this systematic “fix” as well as complete discussion of various other effects taken into account can be found here on the arxiv. This is a very exciting find in physics and with the reported plan to submit this paper for review to a journal a final vetting is in due course. Now we must wait for this experiment to be repeated by the many other long baseline experiments, such as MINOS here at Fermilab and T2K in Japan! So if your days have been anything like mine in recent weeks anytime I talk to anyone with even a vague semblance of what particle physics is and that I am an experimentalist (in training of course) the question comes…. To which I respond politely, “Crazy stuff…but anytime someone says they see something going faster than light I put my hand on my wallet because something is fishy”. If someone is daring enough to push and ask what I think about it my response has been simple: “Science is about repeatability and accuracy so I’ll wait till the next group of experimentalists weighs in”. 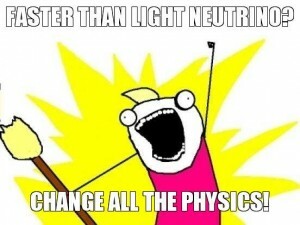 Today on the BBC I saw the news announcement that “Faster-than-light neutrino experiment to run again“. Aside from the obvious things wrong with the title of the argument (this wasn’t an experiment to search for faster-than-light neutrinos) the article explains that during this next run they are going to attempt to remove on of the largest possible sources of systematic errors in the OPERA measurment, namely the length of the length of the proton bunch widths being sent towards Gran Sasso from 10 microseconds to ~ 1 nanosecond with ~ 500 nanoseconds between pulses. While you still can’t measure exactly which neutrino is from which proton the way you would like to in a perfect measurement, this should allow them to be more accurate on average than before and take away a source of error many people I would consider experts have said is of greatest concern. While I’m sure this is only one of many improvements that will be made to this measurement to address all the…shall we say…”constructive criticism” the OPERA experiment has received since their result. The bad news is that if they end up with a null measurement and find that neutrinos don’t in fact go faster than the speed of light the news and fan fare will be much less…because while for scientists a null result is still a result…for the rest of the world a null result is not news. So I think we have some interesting times in experimental physics coming in the very near future! So this Friday is the shutdown of Fermilab’s Proton/Anti-Proton Collider the Tevatron. After almost 30 years of service and numerous discoveries the collider has run her course and is scheduled to be turned off. 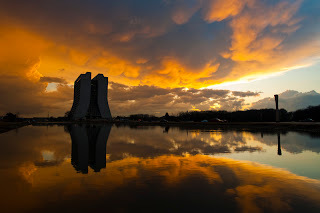 Instead of this being a sad event Fermilab is going to let the old girl go out with a bang! A celebration is planned and I hope to be able to blog about it and bring pictures and thoughts about the days activities. CDF has their experiments collaboration meeting going on over the next few days (at which I am giving a talk on my own analysis) and then a big celebration planned on Friday when they finally shut down the detector and the accelerator. Live streaming media from both the Main Control room as well as CDF and D0 control rooms will be provided by Fermilab Visual Media Services. The festivities and physics to come are sure to be exciting. 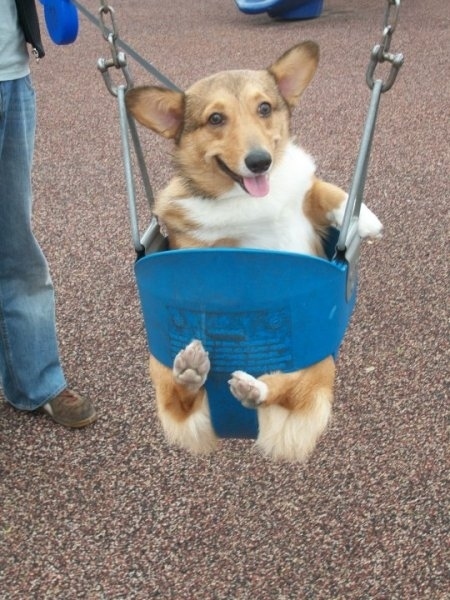 So instead of being sad about the end of one of the most ground breaking experiments in science…here is a picture of a Corgi in a swing….adorable! Now time to digest and see before we turn the world of physics on its head! All the buzz is there…did experimentalists observe neutrinos going faster than the speed of light? To be honest I don’t know and am still gathering information. I’ll bet many of my friends and colleagues are in the same boat as me being asked questions through the many channels available to us (Facebook, Twitter, etc…) to weigh in when we are just finding out ourselves. Hope this helps everyone in figuring out if this is real…I will have more to say on this in the coming days! So as I might have mentioned in the past I have made a full transition to every computer in my house to Linux (with the exception of my wife’s Mac, which she loves). 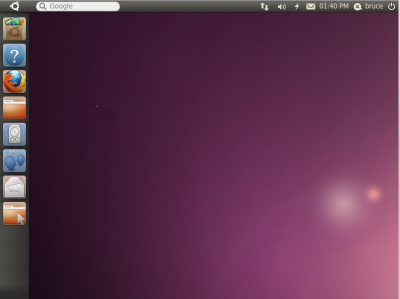 The platform I have chosen after sampling many different releases is Ubuntu 11.04. After a few hiccups getting important applications installed on my desktop and laptop that I use for particle physics work (Kerberos, ROOT, etc…all of which have now been resolved by either Ubuntu or the respective software release) I have been very impressed by the look and running of this OS. The installation on both my laptop and my desktop with dual screen was the easiest thing I’ve ever done in Linux. Gone is the day of having to hack away at your video card and wireless card to trick you computer into accepting Linux and letting you move on with your day. Now Ubuntu has taken the next step and offers cloud storage FOR FREE! 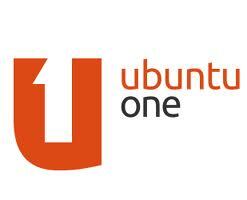 They call their service Ubuntu One and as of this last month you get 5 GB of free storage. Additionally they already offer streaming music to you Android mobile device along with the sync of your contacts. They are also developing the platform on the iPhone as well with that expected to come soon. This feature alone has improved my work life 5 fold. Between going to meetings, traveling to and from the lab, and working from home I was always trying to remember which file on what computer was the most recent version of my thesis paper, analysis nTuple, or even event reduction table. Now I don’t have to worry about it, I just end my work session with allowing Ubuntu One to sync anything I chose to drop into the shared folder and then download it when I get home or to my laptop. Also the looming fear of a computer crashing and losing all my work is greatly diminished, a horror story I’ve heard from too many particle physics people. The feature is expandable and for a low price they are offering up to 20 GB of cloud and streaming, however I expect that number to rise. If you have been looking to make the jump into Linux world and the world of free software and open source code, this distribution is for you. Oh yeah, did I mention that they are allowing Ubuntu One to be open source development … so you know the world of users are only going to make this feature even better. While most labs managed to dodge a bullet mor(what really looked like a giant bomb) in the 2011 budget. There are still many problems coming. Announced Thursday and reported on the Courier News and this blog that Fermilab will seek to reduce its staff by 5% through a voluntary program. With the ending of the Tevatron program in September this doesn’t come as too much of a surprise, however it doesn’t do much to boost morale around the lab. In fact, even though much of the talk is on the future experiments like Long Baseline Neutrino Experiment (LBNE), Mu2e (website), and the future of Project X (website) there can’t help but be a sense of loss for many scientist working there. For me, trying desperately to finish my thesis on work at CDF and looking for post-docs that might keep me in the Chicago land area, pieces of news about the shrinking of the lab only causes me to take pause and check to see if going down this path is the best for me. The little support and almost no excitement coming from a budget strapped government towards science makes it hard for a young researcher to keep a stiff upper lip and look to the future with too much optimism . Oh well, more focus on thesis and hopefully when I lift my head there will be a good position on an interesting and well funded experiment to work on. Google Blows My Mind Once Again!!! I don’t know how this keeps happening but there is always some neat tool or new feature that the folks over at Google roll out and completely blows me away! 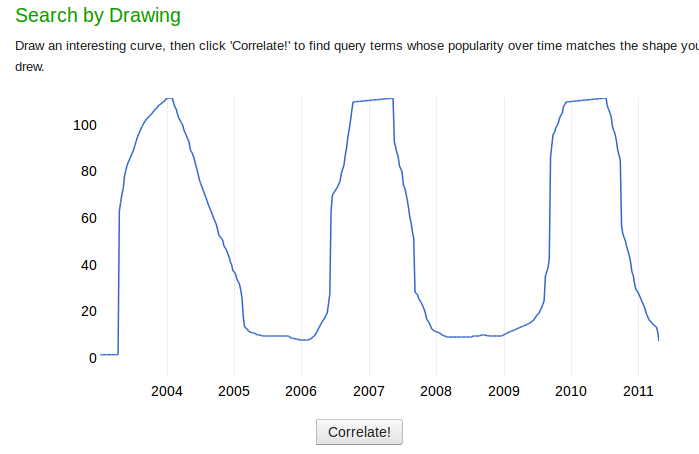 This time it is their tool out of the labs called Google Correlate. 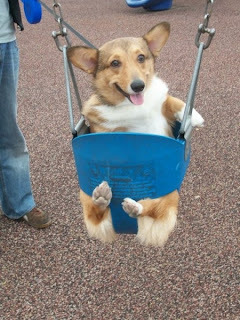 I’ve only just seen this (thanks to my buddy Homer Wolfe for posting on Facebook) and I’m already floored. 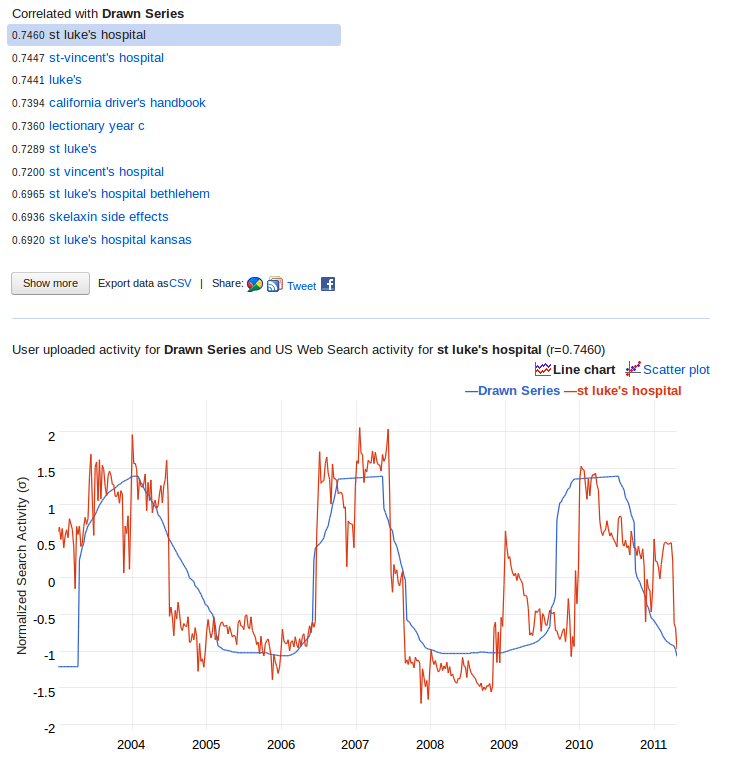 What I can gather is this lets you see how certain search terms are correlated over time, or location, or many other variables that I’m still exploring. The first example that I saw as a search term for Stalin (as in Joseph Stalin). 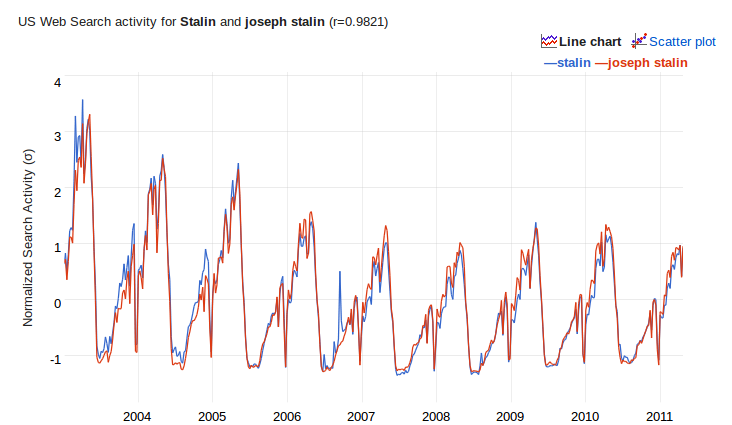 As it turns out, no one searches for Stalin in the summer….weird right?!?! Frequency of search terms for "Stalin"
As if this wansn’t enough to blow me away you can click on the link ‘Search by Drawing’ (http://correlate.googlelabs.com/draw) and pick to draw in your own frequency pattern and it will return a series of search terms that look like what you’ve drawn and tell you how correlated it is. Really cool tool that gives all kinds of intuitive ways to search their search data! Since particle physics people are usually pretty geeky when it comes to how to search data I thought this would be a tool many people would like to play with! Imagine the different implications to how searches could be done with this sort of manipulation of data at a visual and intuitive level. Now granted, most of the searches that go on in particle physics are of this sort (looking for bumps or strong correlation in the data) but the tools that Google is making to allow this to be more intuitive is really remarkable! I thought I would share this post from the Tevatron’s Facebook page (can be found here). 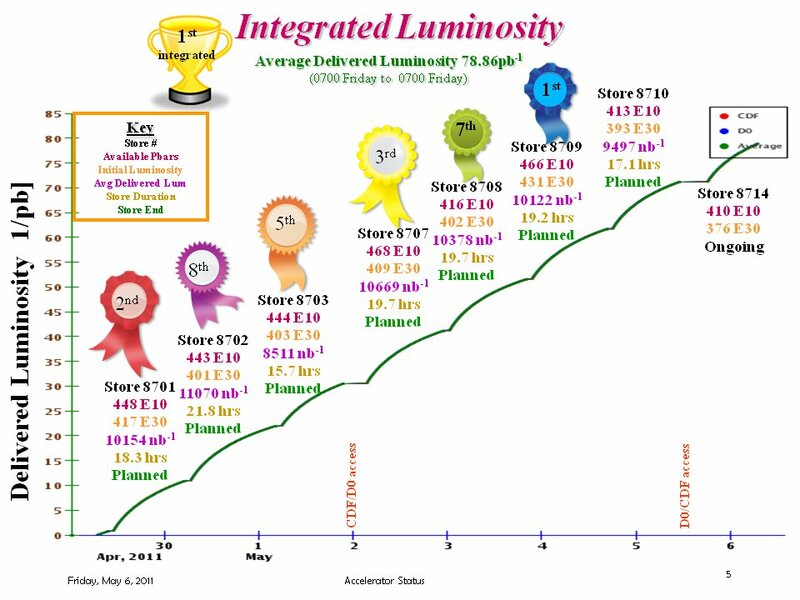 Just in the last week we had 6 of the top 10 initial luminosity stores from the Tevatron and the accelerator delivered 78 pb-1 of data in just the last week! This is really an amazing accomplishment for this accelerator and with this rate of data delivery we can be sure that both experiments that operate on the Main Ring (CDF and D0) will have lots of data to analyze before the planned shutdown in September. For those of you that don’t exactly know what these numbers mean, this is just a simple way of measuring the amount of interactions (or collisions) that we will get during the operation of the accelerator. The higher the luminosity, the greater chance that the collisions will occur and the more interesting data we have to record. What is truly amazing is after 25 years of operations the Tevatron is performing like never before and delivering data and unprecedented rates! This means that there is a greater chance of catching a glimpse at rare processes in physics that may be buried in our data.